Whenever someone asks me what my favorite trail is, it doesn’t take too long before Pass Mountain falls from my lips. It’s always in the top three, once we come to terms on what the definition of “trail” actually is…Are you talking about my favorite local trail? Favorite climb, downhill, or cross-country trail? Favorite trail for riding my singlespeed? Favorite trail to ride after the rain?…I have a ton of favorite trails, one to suite every riding mood. But Pass Mountain, the blessed Pass Mountain is at the top of just about every category. Why? Because it rocks. Figuratively and literally. I think part of it has to do with the warning sign at the trail head. 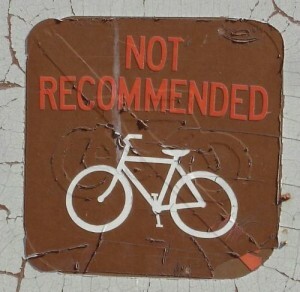 It says “Not recommended” with a picture of a bike. Sadly I do understand why the park has put the sigh there. Pass Mountain has claimed riders in the past and injures just about everyone who dares approach it. 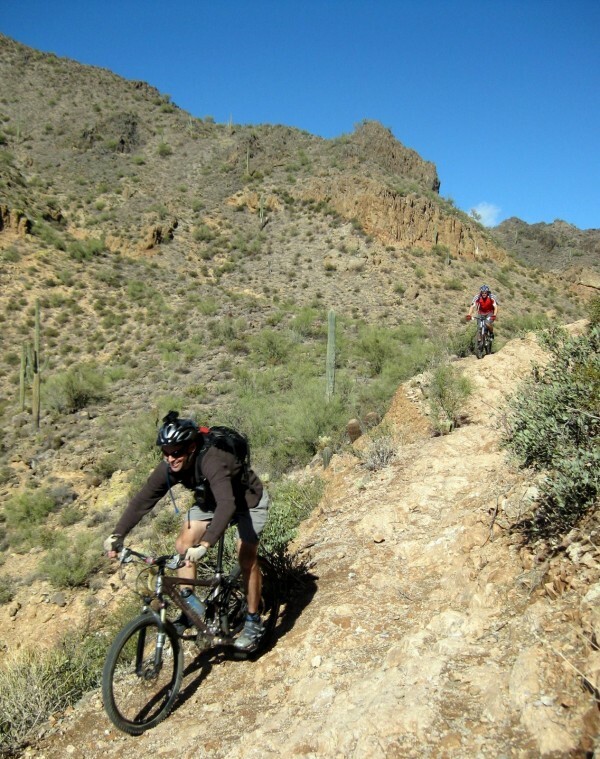 If you are a casual mountain biker that loves flowy non-tech rides through the desert, pass on Pass Mountain. But if you are an adventurous, risk taking climber with a few descending skills in your back pocket, and you’re up to conquer a hefty set of challenges, aerobic, tech, drops, all the while avoiding exposure… clip in and ride this 7.1 mile loop (but make sure you can clip out fast too). Every time I ride Pass Mountain it’s like rediscovering an old friend. I easily wheelie over obstacles that used to stop me dead in my tread. I pass on the easy line and take the tougher one, the one I’ve never cleaned. 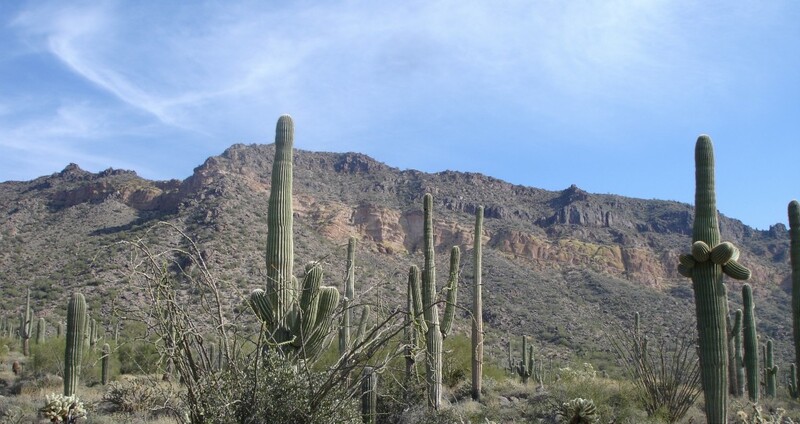 Pass Mountain is a trail full of littler adventures. “I thought this trail was not recommended for mountain bikes, it says so on the map,” “it’s not recommended… but mountain bikes sure are allowed,” was my quick response as I passed him slowly on the right in a wide spot on the trail. Loose rocks…Ha! To a hiker, riding through the rough on two wheels must be hard to imagine. One girl stopped on the trail to let me go, just so she could watch. It was a “feels like Mark Weir” moment for me. I usually start at Crismon and McKellips to tack on a few warm up and warm down miles, but since lunch is only so long, sometimes I park inside Usery Park (depends on how many dollars I can find laying around) and made the traditional clockwise loop from the hiker only Wind Cave trailhead. I’ve always wanted to ride up Wind Cave just to see if it was rideable. From inside the Park, it’s a steady climb all the while dropping into washes and back out until you get to the north lookout. At this point you leave the sun behind rolling into the cool shade of the mountain. This section of trail twists and turns, as you climb east to the saddle. There is one move here that I have never been able to clean, and one climb I call big gnarly (only because there is a little gnarly in Flag already). It is a relentless and rocky climb that bucks me in the same spot every time. A few weeks ago I almost cleaned it. At the saddle I like to chill, refuel, and occasionally make some phone calls. I once had a business call that came up on a day I had a planned ride. Instead of cancel the ride, I was speedy and made it to the saddle by call-in time. No one ever knew how “out of the office” I really was. After the break at the saddle, I psyche myself up for the sweet mind clearing descent ahead. The sign of a great trail is one where I start talking to myself out loud while descending. It starts with just a few woooo whoooos and ends up being a full on conversation with the trail. This unavoidably happens on Milagrosa, parts of National, and on sweet sections of the Highline. I start talking to Pass Mountain about 100 feet over the saddle as soon as I start to pick my line on the slickrock that stripes the mountain. When it’s all said and done, the XC climb back to the Blevins lot is where I like to kick it into speed demon. It’s a great workout finishing off the ride pedaling hard. The first few times I rode Pass Mountain (years ago) I was too worked to do anything but finish the ride. Since then I’ve spent the past few years building up an immunity to the mountain. When it comes down to it, if Pass Mountain were the only trail left in the valley, I would still be a happy rider. Justin, Google Maps are delicate. You’ve got to convert gpx to kml then import ti Google Maps. making sure the track lines are less than 300 pts each or it will split them for you. I’ve been tooling around in UMapper and like it’s ease of use. Hey, thanks for playing the Blog My Trail game! My goal is to get it way bigger next year. Great writeup, too. That one downhill on the SE side must be a little nerve-wracking! By the way, your maps are awesome. I can’t seem to get Google to cooperate … how do you import your GPS tracks?